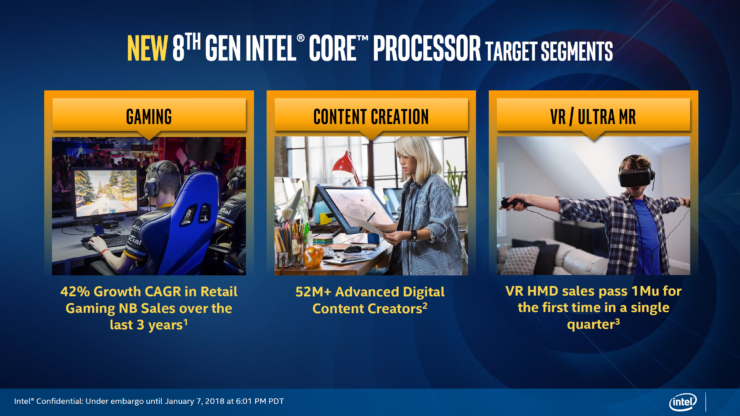 Intel has finally taken off the wraps from their most interesting product to date, the 8th Generation Core processor lineup featuring AMD Radeon RX Vega M graphics. 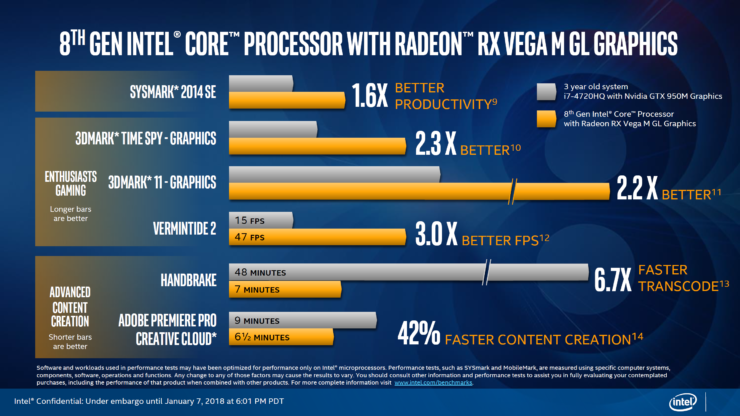 The new processors are built to deliver the best performance possible in a thin and light platform. 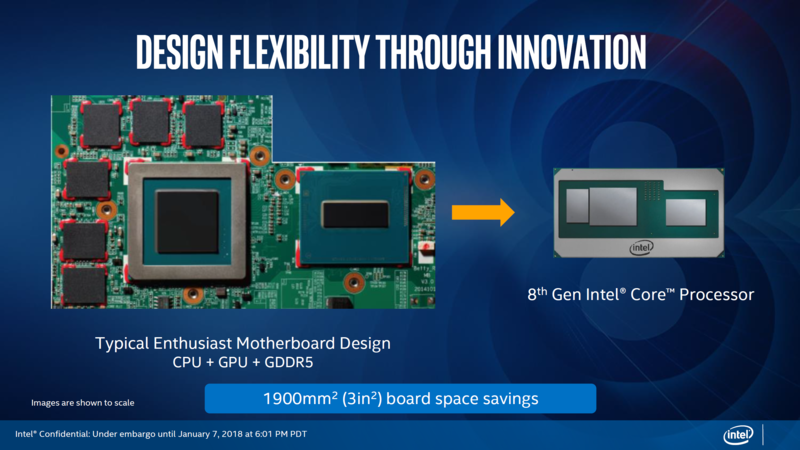 Confirmed by Intel last year, the announcement of the Intel 8th generation core processors with a AMD Radeon discrete graphics chip surprised the entire industry. The chips launching today will be available in various SKUs and combine a range of different CPU, GPU and Memory architectures, all within their separate dies but composed on a single chip. The Intel EMIB interconnect plays a key part in forming a harmony between the different dies. 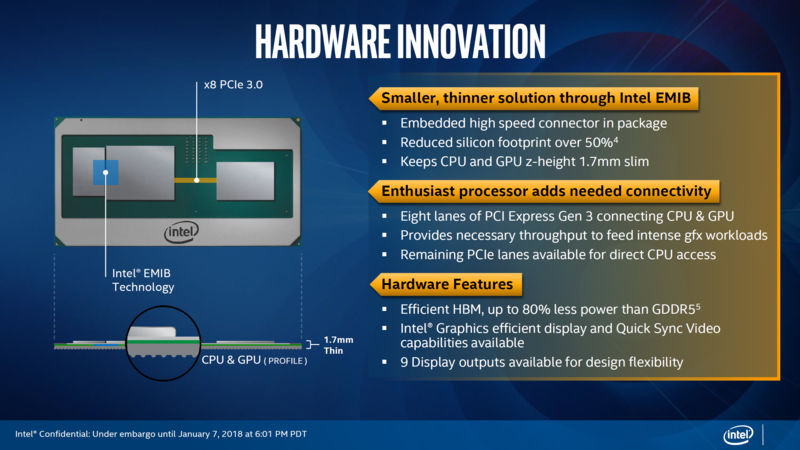 Starting off with the CPU, Intel is featuring their first 8th Generation Core H-Series CPUs on these chips but these will not be the only H-series chips available as there are many more to come, especially the 6 core parts that are expected later. The chip features a unique implementation of power sharing in between the CPU and GPU and is also the first consumer solution to utilize EMIB and also the first consumer mobile solution to use HBM2. 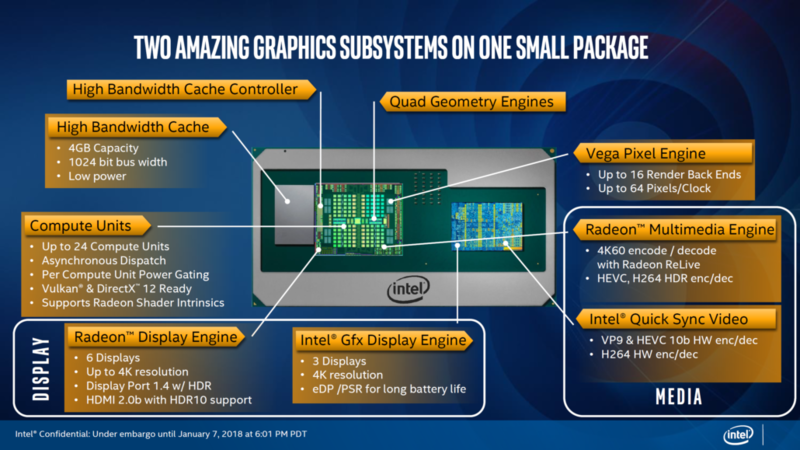 While made to be thin and light, Intel guarantees that overclocking will be available on all dies (for the top variant) such as CPU, GPU and HBM2. The various SKUs will be configured in 65W and 100W variants while we’ll expect OEM solutions from Dell, HP and designs such as Intel’s NUC within Q1 2018. When it comes to specifications, there’s a lot to talk about and let’s start off with the design of this chip first. Compared to a regular CPU and discrete GPU mobile platform, the new chips save over 1900mm2 of board space which can be used elsewhere. 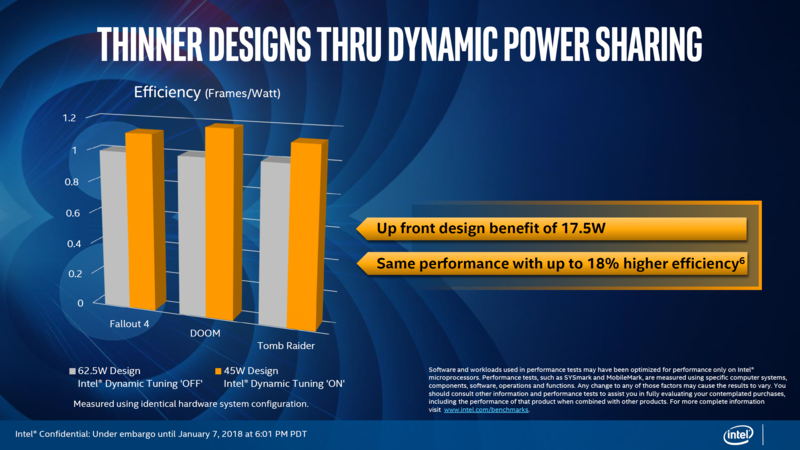 This means that not only the power draw will end up lower but more connectivity features could be added along with better thermals. The chip keeps the CPU and GPU z-height at just 1.7mm while reducing the silicon footprint by 50% as mentioned above. Now talking about how the dies access each other on the new chips. The GPU and HBM2 dies are connected directly by the EMIB interconnect while the CPU is connected to the GPU via eight lanes of PCI Express Gen 3. 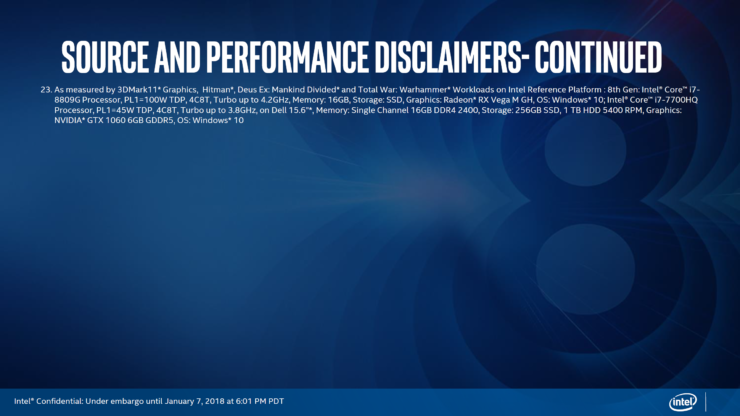 This is said to provide the necessary throughput to feed graphics intensive workloads and the remaining PCIe lanes are available for direct CPU access. In terms of efficiency, HBM offers up to 80% less power than a traditional GDDR5 solution which would also take up a bit more space than the said HBM2 solution. The Dynamic Power sharing feature is very interesting for the new platform. The CPU and GPU can share and balance power based on the application workload. In Gaming intensive tasks, the GPU is said to take bulk of the available power budget while during multi-tasking, that power will be given to the CPU for maximizing CPU based performance in terms of clock speeds. This system is known as Dynamic Tuning and works by checking the current status of both CPU and GPU to confirm their usage scenario and share power to the more workload intensive parts of the chip. In the end, this could lead to a up front design benefit of 17.5W when comparing a system with Dynamic Tuning turned on and off. That’s just about an 18% increase in efficiency and mobile platforms can take benefit from every bit of it. 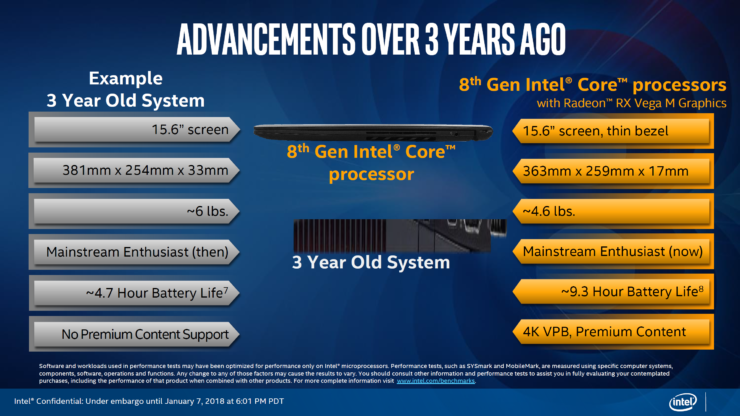 Coming to the CPU details, Intel is calling it the 8th generation high performance mobile CPU. All SKUs that you will soon get to see in the details section feature a quad core CPU with eight active threads. 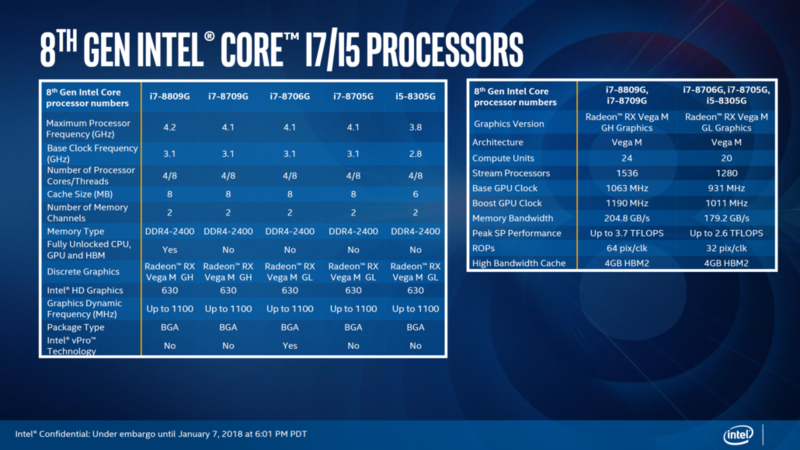 This is about the highest end design that you got with the Kaby Lake H-Series processors but we know that Intel’s current 8th generation Core i7 U-series also feature 4 cores and 8 threads. The difference here is that while the use the same 14nm++ architecture, the extra power envelope means they operate at much higher frequencies. 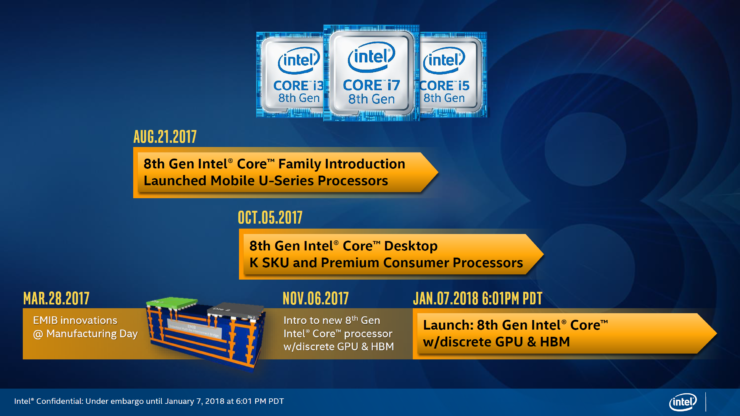 The Intel 8th Generation High Performance Mobile CPUs will be available in several SKUs, these seem to be the most basic variants so far as we have confirmed 6 core mobile processors arriving this year too. In detail, these CPUs feature 4 cores, 8 threads, 8 MB of L3 cache and DDR4-2400 memory support. 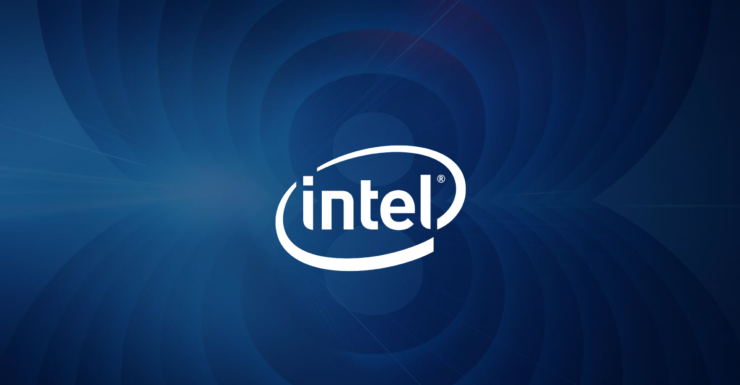 The highest frequencies for the CPU reported are 3.1 GHz base and 4.2 GHz boost clock which are a big jump compared to the Intel 8th Generation U-series. 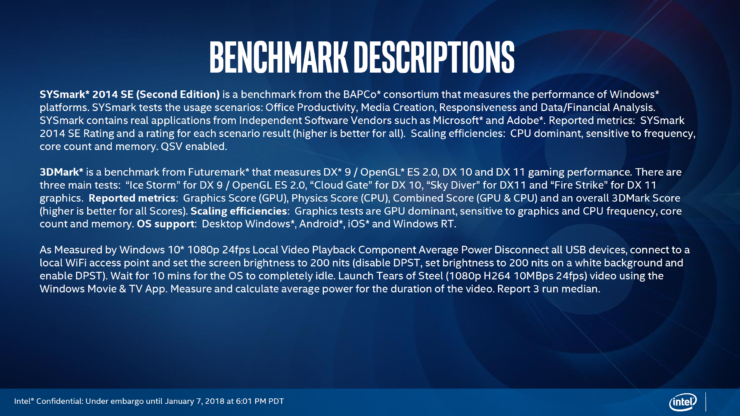 Features such as Turbo Boost 2.0, Intel HD Graphics 630 (1100 MHz clock), Intel Quick Sync Video (VP9 $ HEVC 10-bit HW Encode/Decode, H264 HW Encode/Decode), 3 displays (on iGPU), 4K resolution support and eDP/PSR will be available on the CPU itself. 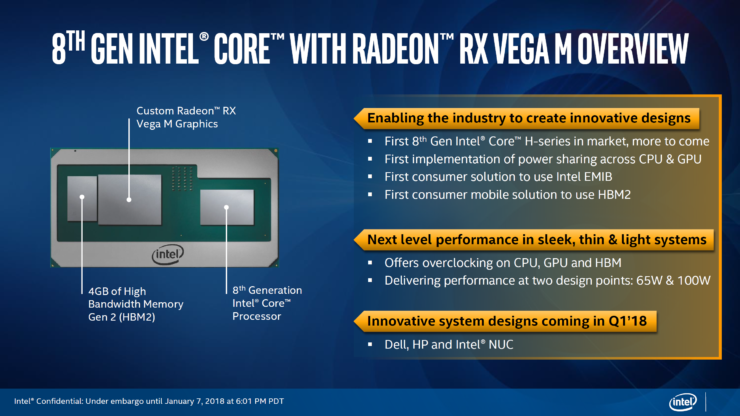 I guess the most interesting part about these chips is the fact that they are the first mobility design to pack discrete AMD Radeon RX Vega graphics. 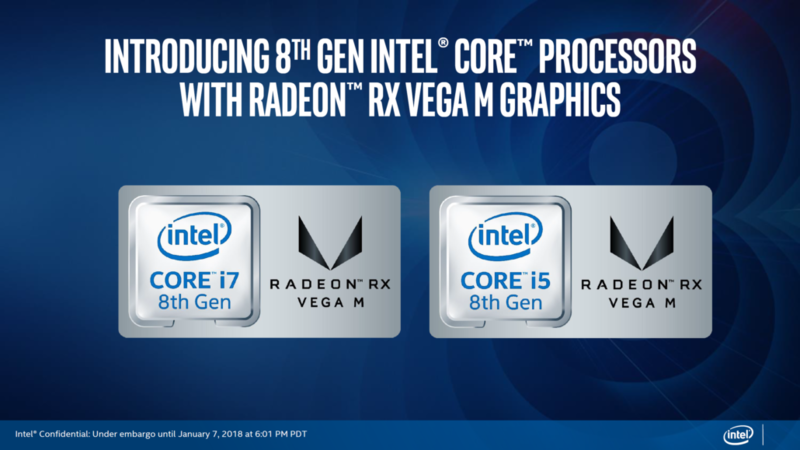 There are specifically two variants that are going to be available on the Intel 8th Generation core processors, these include the Radeon RX Vega 24 and the Radeon RX Vega 20. 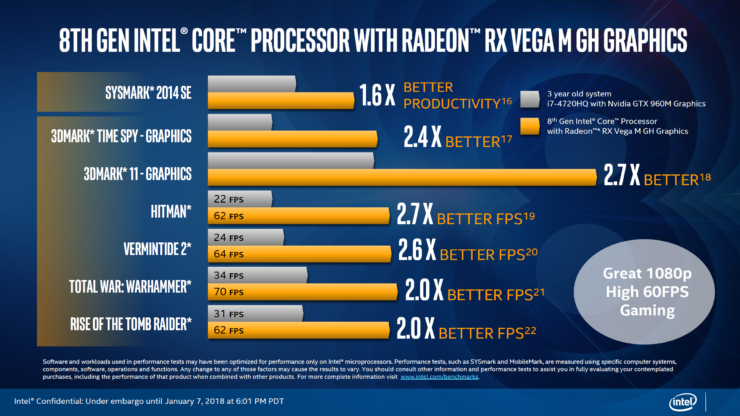 The AMD Radeon RX Vega M GH graphics chip will be featured on the fastest 8th Generation Core i7 processors. 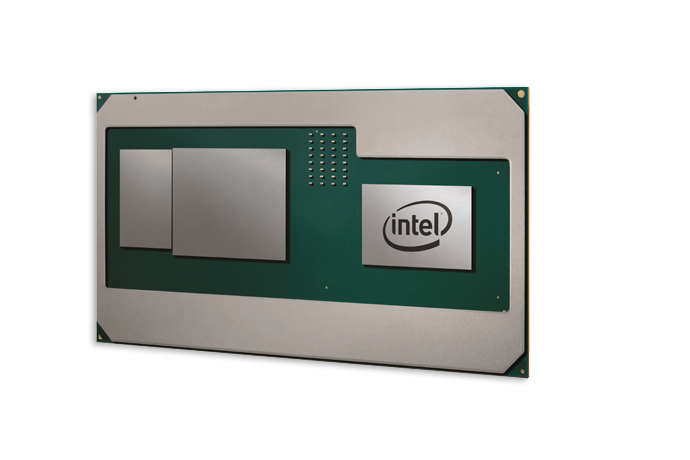 These feature 24 CUs which equals to 1536 stream processors, 96 texture units and 64 ROPs. 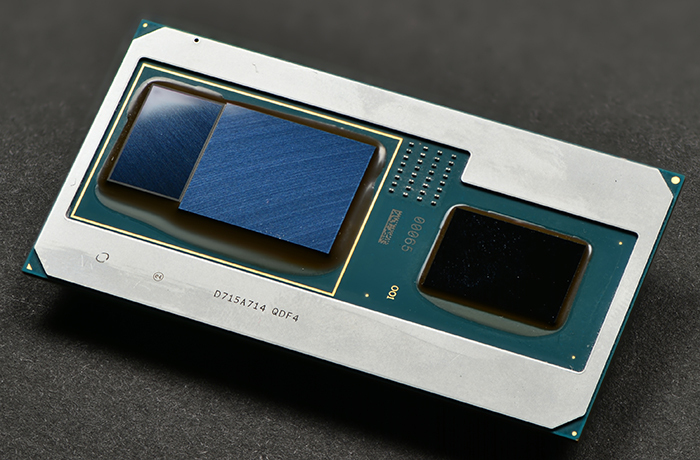 The Vega 24 die is clocked at a base frequency of 1063 MHz and boost frequency of 1190 MHz. These chips deliver a rated single precision output of 3.7 TFLOPs which is just about the same theoretical FP32 output of the GeForce GTX 1060 which does 4.0 TFLOPs on the base version. 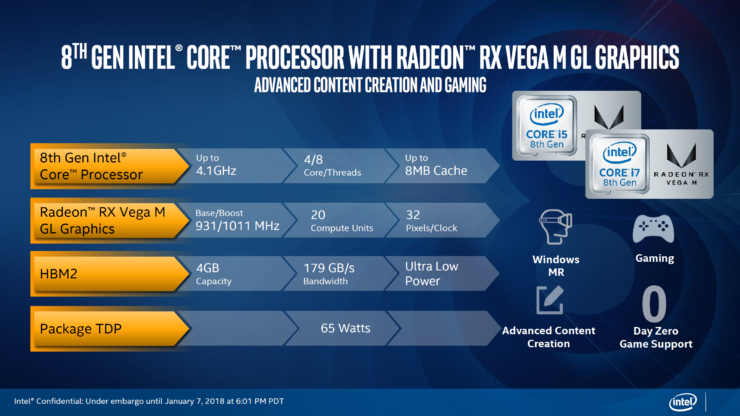 The Radeon RX Vega 24 GPU is accompanied by 4 GB of HBM2 memory and this operates at 1.6 Gbps along side a 1024-bit bus interface, pumping out 204.8 GB/s of bandwidth. For a single HBM package, this is lots of available bandwidth dedicated for the GPU alone. 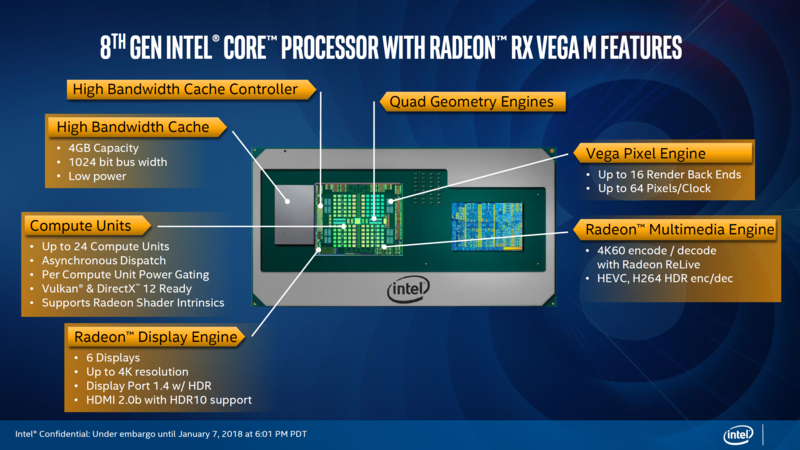 The AMD Radeon RX Vega M GL graphics chip will be featured on a range of 8th Generation Core i7 and Core i5 processors. These feature 20 CUs which equals to 1280 stream processors, 80 texture units and 32 ROPs. The Vega 20 die is clocked at a base frequency of 931 MHz and boost frequency of 1011 MHz. These chips deliver a rated single precision output of 2.6 TFLOPs which is slightly up from a Radeon RX 560 reference design that has 2.4 TFLOPs of FP32 performance. 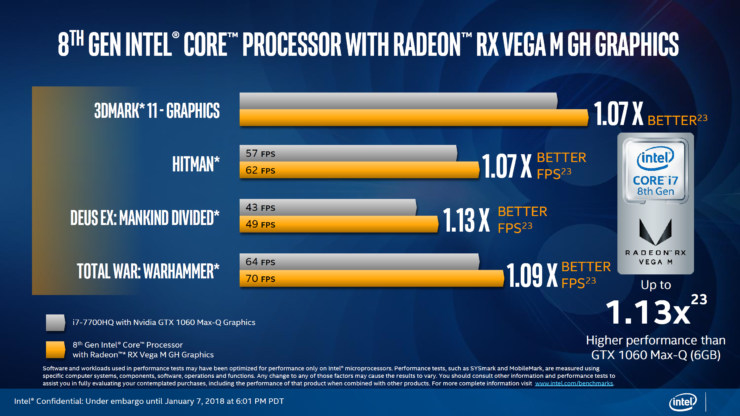 The Radeon RX Vega 20 GPU is accompanied by 4 GB of HBM2 memory and this operates at 1.4 Gbps along side a 1024-bit bus interface, pumping out 179.2 GB/s of bandwidth. For a single HBM package, this is lots of available bandwidth dedicated for the GPU alone. 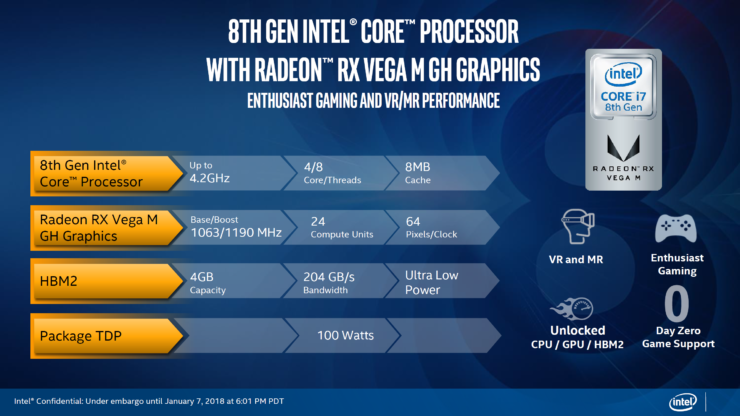 In addition to just raw specifications, the Intel 8th Generation Core processor with Radeon RX Vega M graphics features hardware technologies such as Asynchronous dispatch, per compute unit power gating, Vulkan and DirectX 12 support and Radeon Shader instincts support. Display feature such as the ability to drive 6 displays in addition to the 3 from the iGPU, up to 4K resolution support and Display Port 1.4 with HDR, HDMI 2.0b with HDR10 support are also available from the Vega GPU. There are in total five variants of the chip which include four Core i7 models and a single Core i5 model. Starting with the flagship, we have the Core i7-8809G with 4 cores, 8 threads and clock speeds of 3.1 GHz base and 4.2 GHz boost. There’s also 8 MB of L3 cache and an on-die Intel 630 graphics chip clocked at 1100 MHz. 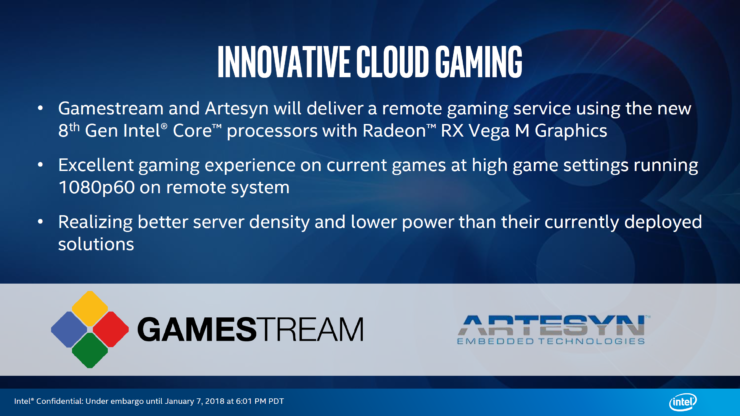 In addition to that, the chip features the AMD Radeon RX Vega M GH graphics with 4 GB of HBM2 running at 1.6 Gbps, all in a 100W package. 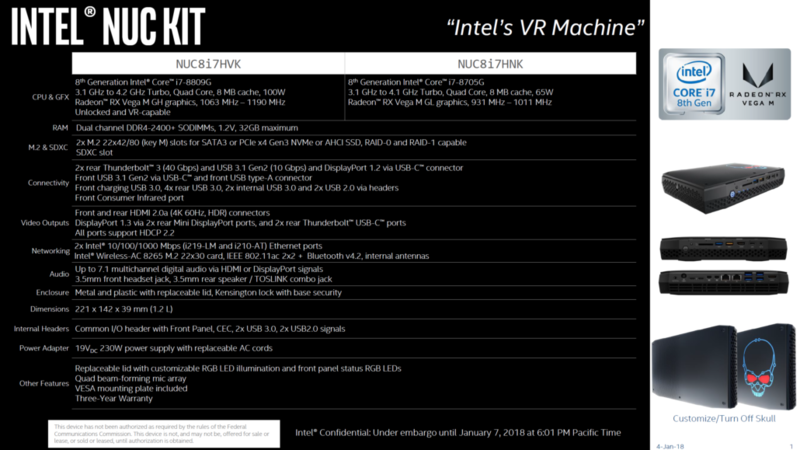 Do note that this is the only variant in the lineup which can be overclocked on all dies including CPU, GPU and HBM2. 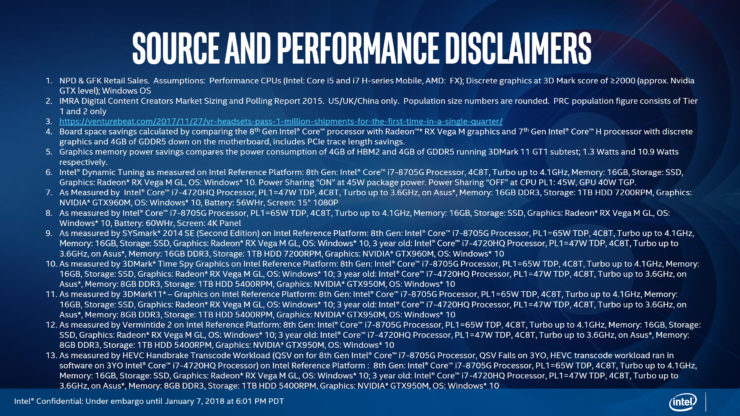 The most juiciest numbers for every new chips come in the form of performance numbers and Intel has loads of them. While these official numbers may or may not be close to real world product performance as provided by independent reviewers, they still provide a key insight of what to expect from a new product from any company. Starting off with the high performance 100W chips, Intel is terming the graphics as great for 1080p 60 FPS (High Preset) gaming. 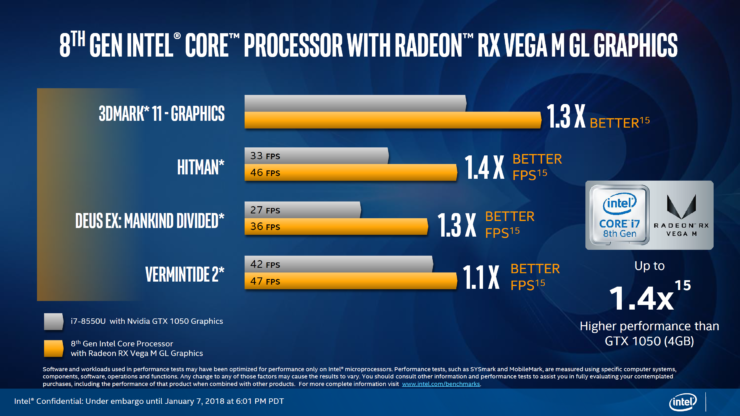 In a range of games and synthetic benchmarks such as 3DMark Time Spy and 3DMark 11, the Intel 8th Generation Core processor with Radeon RX Vega M graphics was north of 2.0x in visual performance compared to a 3 year old reference system which Intel used for testing comparison. This system was powered by a Core i7-4720HQ and NVIDIA GTX 960M graphics chip. In other tests performed over the same chip against a Core i7-7700HQ system with NVIDIA GTX 1060 Max-Q graphics, the 8th Gen chip was 1.13x better. Do note that the titles that were tested included AMD specific games such as Hitman, Deus Ex: Mankind Divided and Total War: Warhammer. For the 65W chips, Intel promises a 1.4x graphics performance leap over a Core i7-8550U with GTX 1050 graphics in gaming performance. 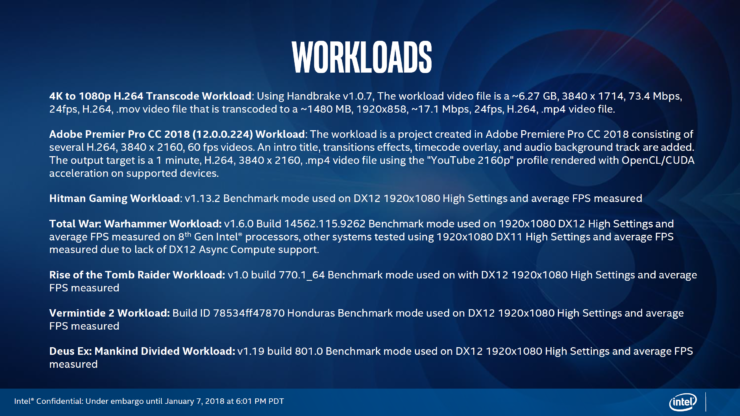 In terms of system performance, the chip with its better optimized CPU should deliver much faster performance in productivity tasks and content creation. 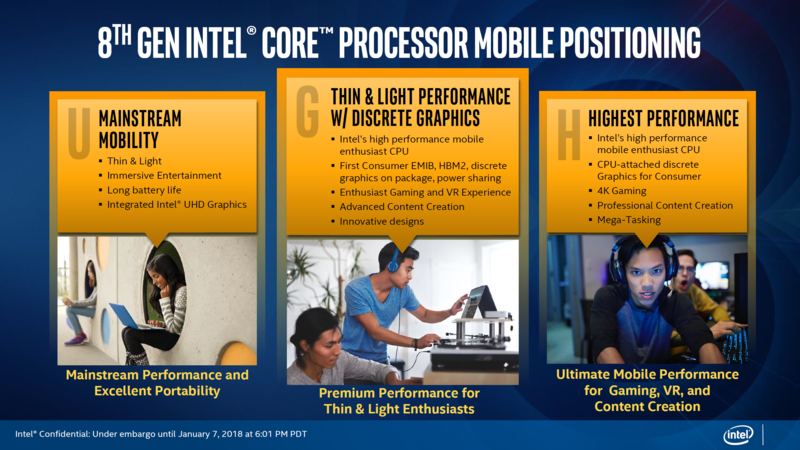 The Intel 8th Generation Core Processors Mobility Platform and The Products – When and What To Expect From Them? 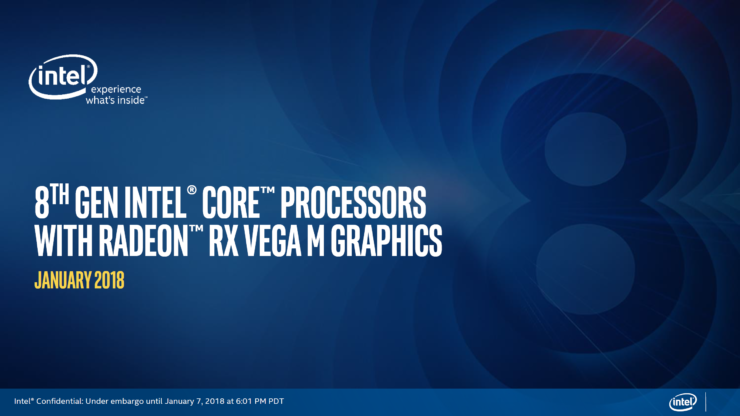 The Intel 8th generation core processors with Radeon RX Vega M graphics will arrive in Spring of 2018 in various devices from Dell, HP and Intel themselves. 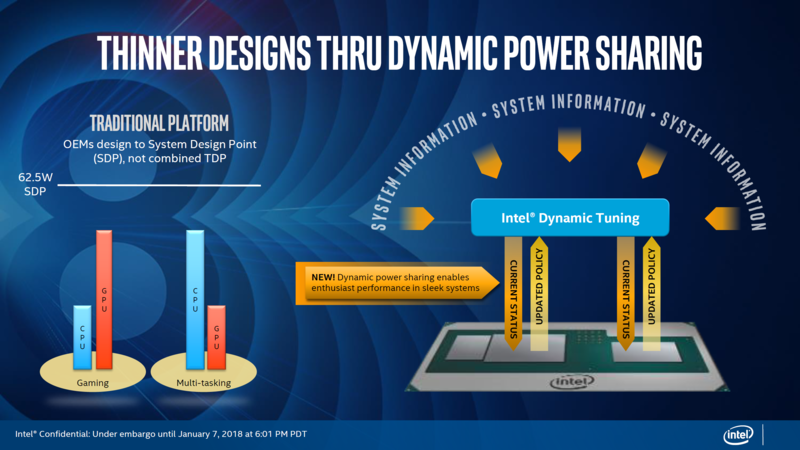 Intel is saying that these devices will not only include thinner and lighter products such as laptops but also small form factor PCs that include Intel’s own NUCs. 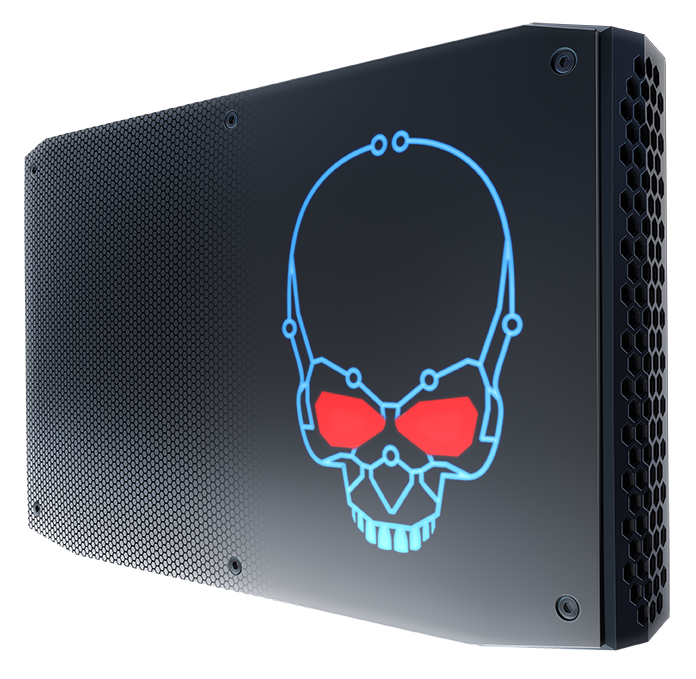 The NUC8i7HVK is based on the unlocked version of the new 8th Gen Intel Core processor with the Radeon RX Vega M GH graphics, giving overclockers the ability to take the system to higher levels. 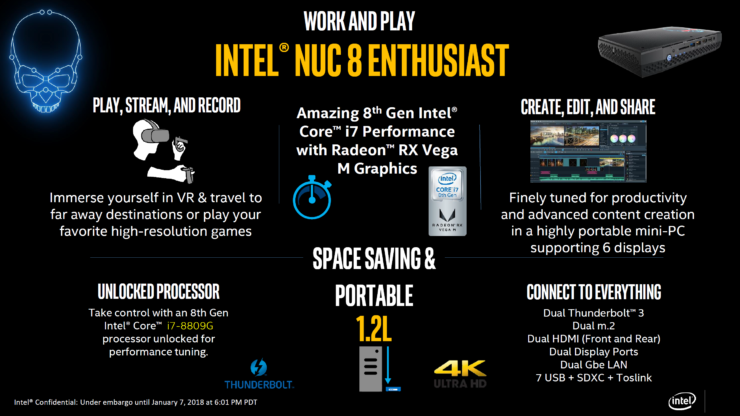 The NUC8i7HNK uses the 8th Gen Intel Core processor with the Radeon RX Vega M GL graphics. 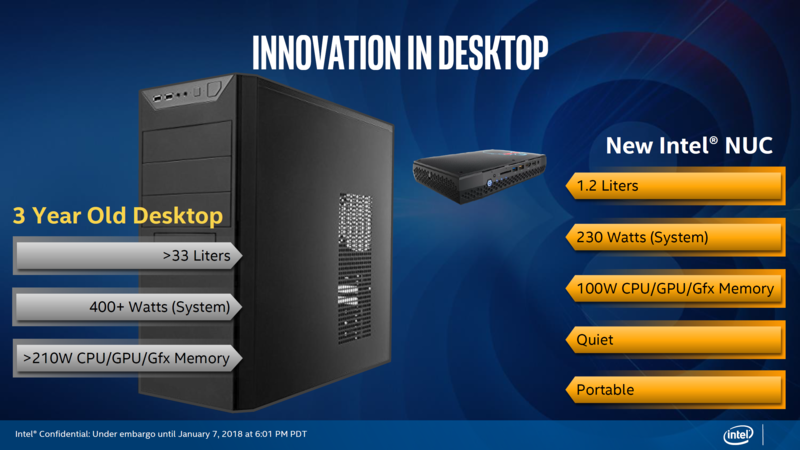 This NUC will be available in a 1.2 liters form factor, with an integrated 230W power supply, a 100W Intel 8th Gen core processor with Radeon RX Vega M and HBM2 while being ultra silent and super portable. 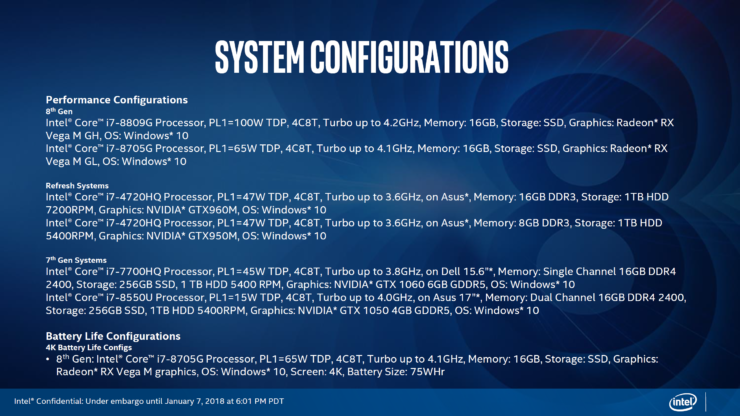 The system will come with a fully unlocked CPU, GPU and even HBM2 which can be over clocked with utilities such as Intel XTU and Radeon Wattman. 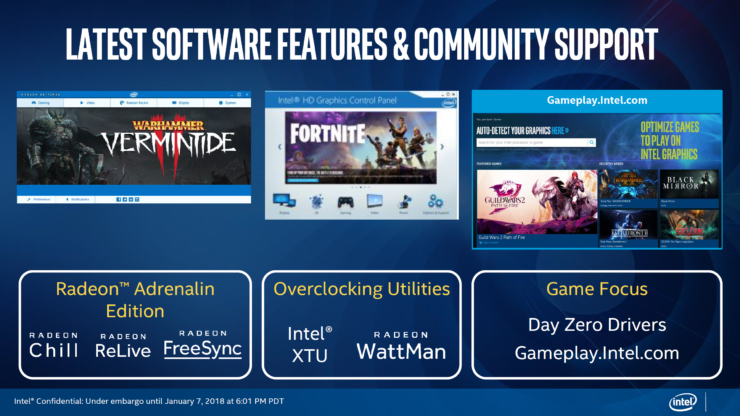 When it comes to software features for the platform, Intel is promising day zero drivers for a range of modern and older titles with support of Radeon Adrenaline Edition which provides useful tech features such as Radeon Chill, Radeon Relive and Radeon Freesync. 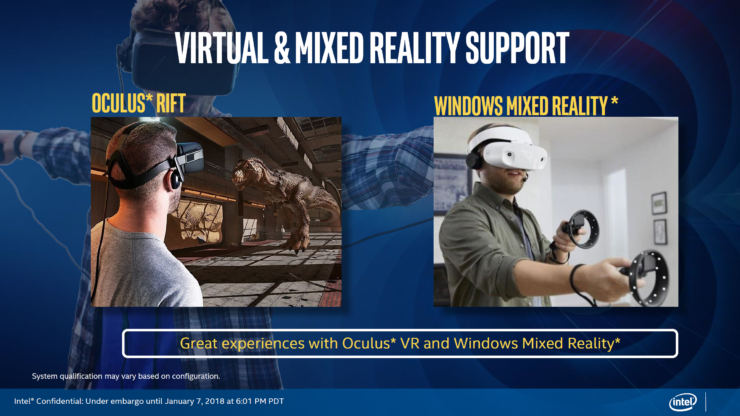 Intel has also made a stand out point that they will fully support Virtual and Mixed Reality on this new platform and software support will be added to deliver the best possible experiences with Oculus VR and Windows mixed reality hardware. Finally, Intel is also confirming that this is just the beginning of what’s next to come in the 8th generation family as they plan the H-series lineup for high-end performance notebook segment and Optane memory coming to 8th generation Core mobile devices for the first time along side the 8th generation Core vPro platform for businesses.